Carrying on from this very popular thread, share your ideas of what enemies you'd like to see in TSoG! There were many very interesting ideas for enemies being thrown around, as well as ideas for completing enemy sets (e.g. having a White Cape enemy, to come along with the Blue Cape and Black Capes from the Psy Academy Map Editor enemy set), and some of them have made it into the Telepath series games already (e.g. Tigs, Greater Ghost)! Hence, do share and show off your creativity! The best ideas will go into this thread. Description: a darker version of you, allowing you to take on the greatest enemy in the game. The gold reward could be dependent upon your level. as all the stats would be loaded form the autosave's hero the programming would be relatively easy. This character could be faced in some dark crypt born from ancient dark magics, created by the shadowlings as either an enemy meant to destroy you or as a trainer meant to test you to the limit of your abilities. The character could also be a mechanical monstrosity created by the mechanics. Intersting, but I don't think that quite fits in with the atmosphere of Telepath games. There was, however, an idea to pit the Main from TRPG2 against the Hero from TRPG3 (aka TSoG). I have to point out though that in the full game you'll probably not have such a well-trained team at the point: quite a lot of people, after playing the game for some time, start complaining that it gets too easy, but then again, with this being an unfinished demo, many simply overtrain their Hero and the teammates, hence the ease of disposal of the enemies. If you want, try playing through the game again from scratch without overtrainig your teammates- that might give you a fresher look on the difficulty of TSoG. Ok, I think the "Guardian" part of the name may be changed a little, but I certainly think that having an addition to the Shadow-Bug enemy set mitgh be nice, with a bug that could do a counter-attack (even melee would do). I wonder though what type of bug would that be? As we have the Queen, the Nymphs and the standard Shadow BUgs themselves. Anyone got ideas for some fitting names? I do like the idea of having an "upgraded" version of the Shadow Bug, including higher damage and elemental immunity. Somethink akin to "veteran" in the name, maybe? Just a passing thought, but what if a ghost bound itself to an item, say a weapon? Nice idea, I do believe that the idea is partially manifested in the Jinn's present in the game, like Iblis (bound to a statue, a very powerful enemy boss at that!). how about instead of shadow bug, you call it darkness bug or something along that line, so it can relate to the shadow bug but still be a separate unit? how about an Abyss Bug, or a Void bug? I like the abyss name better than void because you think void and its just a big nothing but you think abyss and you think dark mysterious. See, I thought shadow bug guardian would be a good name because they could be for guarding their nests, or the queen. Well, there is already a Shadowling Guardian, so that's a bit of a repetition. I prefer void bug over abyss bug myself. 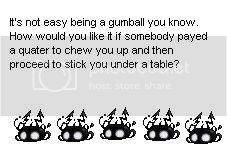 I also imagine this kind of bug to be quite old, with a touch of grey, for which I think of Gloom Bug or Dusk Bug, though that doesn't sound quite as good. How about Night Bug or Twilight Bug? Also, given that the Shadow Bug enemy set is a medium difficulty one, I think this bug be better equipped with a non-area attack, but quite a powerful one none-the-less. How about Double Strike worth 18 damage? And then Melee as a counterattack for 11 damage? I think that would be quite nice, as the enemy would then formally have 2 attacks. Come to think of it, with regards to the original proposed name, why not drop Shadow and keep it simply Guardian Bug? Given that the bugs also have a queen, that might be a nice parallel to have! And I am definitely for expanding the Shadow Bug set: this could allow for more variety in map making with regards to the Shadow Bugs (and maybe party use that in the Gelf side quest ). I like guardian bug if its only going to appear when you fight queen bugs. I think that if it shows up other places it should have a different name like void,abyss or night bug.